For a long time, I stood there looking at the pig, looking at where one of the front legs, sawed off at the knee, joined the body. There was a lot of hair in there. To get at the hair I would have to bend the leg away from the body. I stared at the hair, and I wanted my father to know that I could do the job he had given me. The dead pig flesh looked very like the flesh of a person, and I began to think of all the boys in my class in school with their shirts off, and their galluses on their bare shoulders holding up their trousers, their bodies the same colour as the pig's, not even much warmer in the cold classroom. Once a year we have the county doctor's examination day in the school. The night before the examination everyone is supposed to wash themselves. On examination day all the desks get pushed back to the classroom walls. The minute the doctor arrives, the boys take off their shirts so the doctor won't be kept waiting when it's the next person's turn. The townie boys point at us and say we are so thin the harp could be played on our ribs. We could point to some of the townies and tell them they are so dirty potato seeds could be sown on the backs of their necks, but they would only beat us up later in the schoolyard. The strange smell of the blue flames under the silver pots fills up the classroom. The clean nurse in her white clothes puts the doctor's instruments in the pots and lets them boil while she weighs everyone. It's like the school is no longer a school: no desks, the doctor, the nurse, the smell, everyone with his shirt off, all the pink flesh, the teacher gone somewhere. In a straight line, we move slowly towards the thin, white weighing scales on the floor with the spinning numbers. The nurse says the same thing to everyone. "Step up. Don't move." Then she fills in a little box in a white card, and she says, "Step off. Stand over there." When she has weighed five boys, she measures them to see how tall they are, presses their bare backs against the cold, green wall, and puts a ruler on top of their heads. She says the same thing to everyone: "Put your back to the wall. Put your toes to the line. Stand up straight." She fills in another box on the card and says, "Stand over there." We wait our turn with the doctor. The doctor pokes each boy in a whole lot of places as if feeling a pig to see how fat it is. He feels the arms, lifts them up, and feels the armpits. When the boy squirms at the tickling, the doctor says, "Stop that!" He looks at the fingernails. "Stick out your tongue." Then, like magic, a tongue depressor is in his hand, and before he even puts it in the boy's mouth there's the sound of throwing-up noises. "Stop that! Say aah." The tongue depressor makes the eyes water. While the boy is trying not to throw up, the doctor has already taken the depressor away from the throat and he's moving it around the mouth as if he's looking for something he lost. He pushes the cheeks out, lifts the top lip, taps teeth, looks up the nose, pulls the ears back and looks in. The doctor does everything very quick. The worst thing he can ask is, "When was the last time you washed yourself?" because that means he knows the boy he's asking hasn't washed for ages. The doctor, without even asking me to open the buttons of my fork, suddenly had his hand in my trousers. "Stop that!" he commanded when I doubled over and pulled away from him. "Look that way and cough," he said. I looked towards the window and coughed. He took his hand out, and while he was filling in a lot of boxes on my card he asked, "Are you a farmer's son?" Before I could answer, he asked me another question, "Is that mark on your face from ringworm?" Before I could answer, he said, "Tell your mother not to let you near calves with ringworm. Next." The next boy was Sean Delaney, who was turned around talking to the boy behind him. Sean Delaney jumped when the doctor shouted "Next!" at the top of his voice, his face so red it looked like it could burst. Then the doctor said, "Nurse, are you doing your job?" The nurse blushed and said, "I'm sorry, doctor." She went to the boys who were queued up for the doctor and hissed at them like a goose standing up to a dog: "The next boy who talks will get an injection." 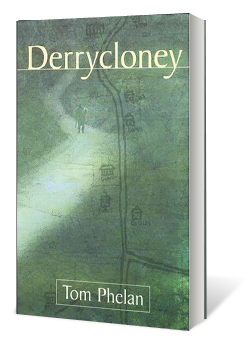 From Derrycloney by Tom Phelan, copyright ©1999 Glanvil Enterprises, Ltd., Freeport, New York. Published by Brandon Books, a division of Mount Eagle Publishing, Dingle, County Kerry, Ireland. All rights reserved. Kindle edition published by Glanvil Enterprises, Ltd.